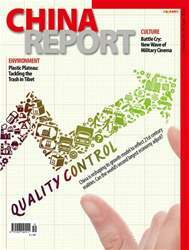 From China speed to China quality – how can the country shift its growth model from quantity to a quality? (P.12-25) China is taking its fight against plastic waste to a new height - in the Qinghai-Tibet Plateau (P.43-45). The pros and cons of Blockchain technology according to the former President of Bank of China. Is China ready to embrace it? (P.46-49) Love and Producer, all about the profitable mobile game China is falling in love with (P.34-39).